Former Ultimate Fighting Championship (UFC) women’s bantamweight champion Miesha Tate weighs in on Conor McGregor’s latest run-in with the law. 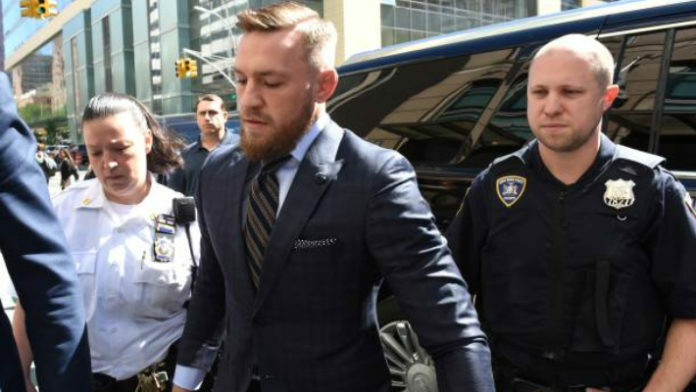 McGregor was arrested this past Monday (March 11) in Miami Beach. The “Notorious” one allegedly stomped on a fan’s iPhone and smashed it. The fan’s phone was valued at $1,000. Video later surfaced showing that McGregor did indeed damage a phone. The “Notorious” one posted $12,500 bond and was released from jail just hours after his arrest. “It’s not breaking the law [fans asking for pictures], and it’s not illegal. It’s annoying, but it’s not crossing the line. He is a megastar. He has made himself into one of the most recognizable faces … and he’s making millions and millions and millions of dollars. He’s created that. So, what I think is that this fan was out of line. He was disrespectful and probably should’ve had a little more common sense to respect the space of Conor. With that being said, I guarantee you that guy’s bought every single one of Conor McGregor’s pay-per-views. McGregor is facing charges of strong-armed robbery, criminal mischief, second-degree felony, and third-degree felony. MMA News will keep you posted on further updates when they become available.